"25 rebels of many ages gathered already on the evening of 30/6 for Fun@Work"
Let's change the way we work - and make it fun! The photos were taken during van Helsing's representation at a workshop on 1st July 2003. The workshop arranged by Olavi Luotonen from the European Commission Information Society Directorate-General New Working Environments was to test the concept of the AMI@Work family of ERA communities. These are self-organising communities relating to New Working Environments (European Research Area at work), linking people in new and existing EU Member States (and beyond). Van Helsing's delegates were delighted to participate in this international knowledge-sharing exercise particularly so as many of developments are akin to the methodologies used by the company in the delivery of its "Sustainable business and organisation development" projects. 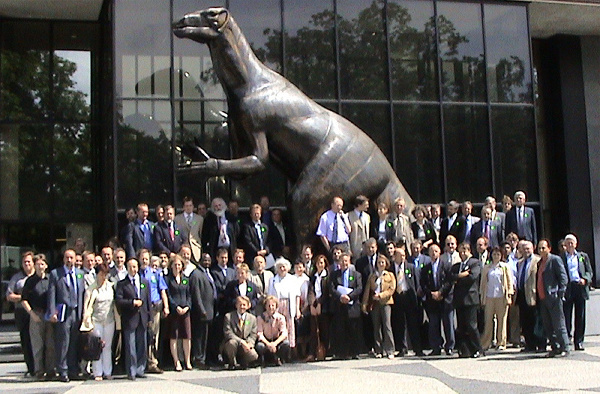 The 1st AMI@Work family of communities' workshop brought 80 of us to the Natural History Museum in Brussels. van Helsing's involvement in EC research projects started in 1999 when we became part of an Anglo-Danish consortium under the EC's User Friendly Information Society Technology Framework V programme. The project became known as - "the Safe Food Enhancement System (SaFES) trial". Van Helsing used the trial to have a bird's-eye view as to the effectiveness of various knowledge transfer mechanisms between a set of multi-disciplinary experts working remotely in a virtual team both in the initial development and subsequent use of the SaFES tool. The project aim was to develop and trial a tool for dispersed production teams, to develop bespoke Failure Mode and Effect Analysis-style safety plans that had to be within a prescribed framework. Of great interest was the managing of a diverse team distributed in companies large and small across Europe and we decided that we would test e-working as far as possible in the management of the project. Some cost effective methods of system production were also tried. Communications protocols were put in place to counteract the physical distance between the parties in order to lessen travel costs and minimise face-to-face contact. A paper propounding the concept around which the team developed the tool was delivered at the e-Business and e-Work conference in Venice in October 2001. The Failure Mode and Effect Analysis type plan, known as a HACCP, will be required by companies in the food industry working within a quality-assurance legislative framework. Due to the nature of the industry, every plant is different and legislation requires each one should be considered as an individual case, therefore it is not possible to sell a "One Size Fits All" Off the Shelf system. This calls for a system that has to be individually implemented that maps onto the factory's processes. The plan has to achieve a legislative standard, encapsulating parameters that are specific to the types of product, the types of equipment and the industry knowledge of the particular sector. In the past, the implementation of such a system has been costly because it incurred a lot of travelling. Expertise (normally in the form of consultants) has to be brought in, many of the plants are in remote rural locations, experts have to acquire information specific to the plant for the staff to put into the system. All in all a very costly and onerous process; consultant friendly, but not very client friendly. Not very affordable, and if a plant undertook the exercise once, they didn't necessarily update inline with their equipment upgrades thus nullifying their previous work. Basically the project involved producing a framework for performing the consultant-led study so that the plant staff could be led step by step through the process making sure that all elements in the process were covered. 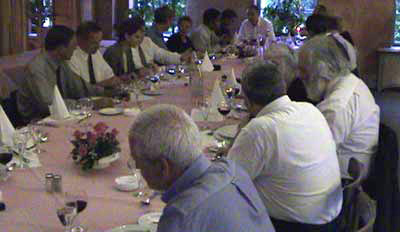 Links had to be provided to areas of expertise so that remote working between consultant and plant could be carried out at a far lower cost, allowing international customers, trade/industry associations, professional bodies and other interested parties regardless of physical location to participate in this process and ensure that the process is progressing under the required framework. A consequence: the concept allows for individual stakeholders to collaborate remotely in the derivation of plant processes at an early stage, yielding closer co-operation along supply chains and improved consensus building in time and cost sensitive environments. A paper describing some of the results of this project was presented at "Challenges and Achievements in e-Work and e-Business" in Prague in October 2002. More details can be seen in the End of Trial Report on our SaFES web page.